Punctiform contacts clearly define the progression of force or how the incorrect position of a contact can put transverse load on a tooth. 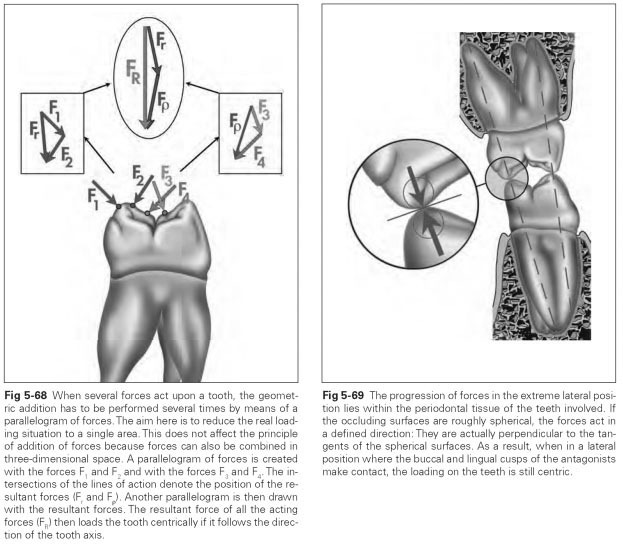 Before a description of how forces act on a tooth is given, here follows a brief explanation of the physical principles governing forces and how they are combined: Forces can be represented as vectorial values; ie, they can be illustrated as arrows. The length of the arrow is a measure of the size of the force, and the direction of the arrow is the direction of the force. 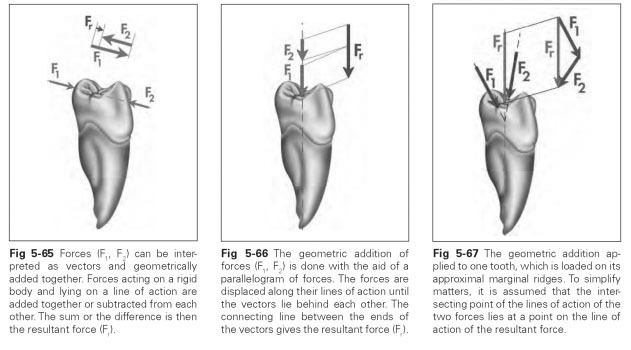 The forces on a rigid body (in this case, the tooth) can only be displaced along their line of action, ie, on a line that is an extension of the (force) vector; parallel displacement is not possible. When several forces act on a tooth (or a rigid body), they can be combined to produce a resultant force (equivalent force).The individual forces are known as components.These individual components can be combined by geometric addition to produce a resultant (Fig 5-65). If several forces are located on a collective line of action, the sum or difference of these forces is the resultant. If two (or more) forces have a collective working point, a parallelogram of forces can be constructed and they can again be combined by geometric addition to produce a resultant force (Figs 5-66 and 5-67).The resultant can be calculated according to the trigonometric law of cosines. If more than two forces act on one point, a parallelogram of forces or a polygon of forces has to be created several times in order to add the forces together geometrically (Fig 5-68). Forces with different working points are displaced along their line of action up to an intersecting point, which produces a normal parallelogram of forces. A resultant force with the correct total and the correct direction, but not the exact position, is obtained. However, because the resultant can also be displaced in its line of action, the midpoint of a rigid body can be assumed to be the working point. In the case of a tooth, the point where the line of action of a resultant force intersects the tooth surface can be taken as a first approximation of the working point. During static loading of the teeth in terminal occlusion, a tooth is physiologically (ie, centrically to its periodontium) loaded by the sum of forces, despite forces acting eccentrically. As masticatory pressure is absorbed during a movement when teeth are in contact, the forces alternate in their direction if not in total. An extreme lateral position shows how the progression of force takes place there. All the positions between these extremes and terminal occlusion will show resultant forces whose lines of action lie somewhere between the lines of action of those two positions. If the forces of the two positions are absorbed by the periodontium, the intervening forces would also have to be compensated. The progression of force in the extreme lateral position lies within the periodontium of the teeth involved, if the occluding surfaces are roughly spherical. The forces act in a defined direction because they are perpendicular to the tangents of the spherical surfaces (Fig 5-69). This means that in a lateral position, in which the buccal and lingual cusps of the opposing teeth contact, the loading on the teeth will still be centric. Flared or splayed roots of multirooted teeth are ideally suited to absorbing forces that arise during lateral movement with tooth contact. Such transverse forces are more likely to occur with posterior teeth (molars), which are multirooted. The real progression of forces during movements is not entirely covered by this illustration of extreme positions, but this does provide a good approximation. In particular, it clearly shows the need for punctiform contacts to be retained even during lateral movements. If just one contact is lost during the movement, the relationships alter, or uncontrolled faulty stresses will result. Therefore, when contouring occlusal surfaces, it is always important to check contacts by means of lateral movements in an articulator. Principles of mechanics are applied here to explain the characteristic features of form of a physiologic system. The explanatory model should merely be seen as a guide to illustrate the advantages of punctiform contacts or as an aid in understanding why it is so necessary to reconstruct the masticatory area based on certain formal con-siderations.This model does not take into account other influential factors that may play a role in the development of these characteristic features.